Design, Build & Manage the Ultimate Zoo - Create a wildlife sanctuary without parallel with Zoo Empire. As owner of your zoo, adopt animals, landscape and build exhibits, hire and manage employees, and keep visitors happy as the money pours into your virtual zoo! Unlock animals, research new technologies and learn all about the challenges of modern-day animal care as you progress up the ladder of Zoodom. 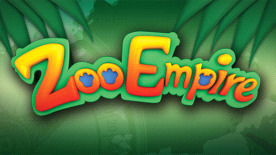 Fun for All Types of Gamers - Zoo Empire features a 30-scenario branched campaign mode for those wishing to undertake their greatest challenge of their zoo career, or simply indulge yourself in the sandbox mode, where you make your own rules and play as you wish. Become the Next Star Attraction - Train your animals to perform in spectacular shows that will please and entertain your visitors. Invest in advertising so your animals gains popularity. You can save your animal profiles for your best animals to perform shows and promote your other zoos! Choose Your Own Career Path - Test your abilities as an financial whiz, or get your feet wet in the wonderful world of wildlife conservation. Zoo Empire features a branched path career mode that allows you to place the emphasis on the business or zoological end of running your very own zoo. Either way, no matter how you play, no two career paths, or challenges, are the same! Tour the Zoo in Style - Choose from three train and boat designs as you set up touring facilities by laying out tracks or digging rivers for spectacular guided tours around your best exhibits. Then see your visitors line up for the thrill ride of a lifetime! Capture the Moment from Any Angle - While your visitors are wowed and entertained by your cuddly creatures, build your own wildlife photo album by taking snapshots of your animals performing dozens of unique lifelike animations, all in full 3D.